This text of Soares has been in my G4 awaiting editing as I logged up the mileage across France and Germany for parts of the last two months. Fortunately my tardiness in posting won't have any effect on the timelessness of what is a classic American story. And the current message shouldn�t be lost on those "over there". I�ve just finished reading a biography of industrialist and powerboat racer Gar Wood (Gar Wood Boats: Power Classics of a Golden Era, Anthony Mollica, MBI Publishing 1999). Wood grew up in the 1880�s stoking his father�s ferryboat on the lakes of Minnesota, caught the engineering bug at the turn of the century, and invented and patented the hydraulic dump truck. He then spent over thirty years funneling his profits into winning Gold Cups, Harmsworth Trophies, and international speed records in Liberty-engined hydroplanes. At the same time he also built sleek and powerful gentlemen�s speedboats in varnished mahogany at a state of the art factory. Gar Wood built his industrial empire with his own labor and had little interest for Wall Street or high finance. When the New York financiers who controlled the American Power Boat Association re-wrote the rules to squeeze Wood out after he won 5 Gold Cups from 1915 through 1921, he went into international racing and feats of record-setting, such as beating the Twentieth Century Limited from Albany to New York City by 21 minutes in Baby Gar IV in 1925 and exceeding 100 mph on the water in Miss America IX in 1931. Wood hated debt and financial wheeling and dealing and personally owned all but 3 percent of his companies� 800,000 shares of common stock. Unlike his rivals he thrived throughout the Great Depression and was able to continue to spend lavishly on his version of motorsport. Gar Wood�s story is a classic American success story, the story of a great American sportsman. It reminded me immediately of the two leading sportsman of American racing, who will do battle head-to-head in this year�s American Le Mans Series. Like Gar Wood seventy-five years ago, Roger Penske is based in Detroit. In many ways, Penske is Detroit�s last great self-made man. First and foremost a racer, Penske won championships in his own Zerex Special and in Jim Hall�s Chaparrals forty years back, but then retired to make his fortune in the auto biz. 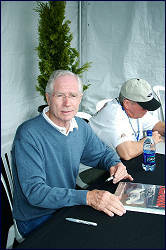 He turned a Pennsylvania Chevy dealership into the revival of Detroit Diesel, into Penske Leasing, and ultimately into United Auto Group, one of the biggest auto sales conglomerates on the planet, while winning the Indianapolis 500 fourteen times as a team owner. Along the way Penske helped create the Can-Am champion Porsches, the Trans-Am Camaros and Javelins, and his own Formula 1 chassis and team (where racing partner Mark Donohue met his untimely demise in the Summer of 1975), as well as making his mark in NASCAR starting with the AMC Matador through the current Nextel Cup series. At the end of the 2005 ALMS season he debuted the Porsche RS Sypder P2 car and after many public teething troubles won the 2006 P2 championship with a two-car effort. For the 2007 season Penske will be racing against at least one other Porsche P2 team, the new two-car equipe of Rob and son Chris Dyson�s Dyson Racing Team. Rob Dyson is unlike self-made men Gar Wood and Roger Penske in that he is the steward of a family fortune accumulated by a previous generation. However, in my mind he also recalls a great American sportsman, yachtsman, and sportscar racer: Briggs Swift Cunningham. Cunningham was the beneficiary of the Swift meatpacking fortune but he wasn�t simply some silver-spoon country clubber smacking polo and golf balls around the lawns of the family estate. 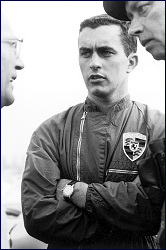 Cunningham won an America�s Cup at the helm of Columbia in 1958 and spent over a decade in pursuit of victory at Le Mans and Sebring, several times in cars of his own manufacture. Briggs Cunningham�s love of cars was more hot-rodder than dilettante, and I fondly remember the museum in Costa Mesa where he proudly displayed his Bu-Merc and Le Monstre amongst the detritus of forty years of messing around with cars. Rob Dyson may be wealthy beyond the economy of one or two small European countries, but like Briggs Cunningham he is a car guy through-and-through. While I can�t claim to know the man, the image of him I�ll always carry is of a conversation I had with him in the paddock at Laguna a few years ago. As we talked he meticulously wielded a push-broom around his team�s work area, tidying up at six in the evening long after the bought-ride crowd had retired to the local eateries. Dyson�s investment in developing the 2006 Lola B06/10/AER package last season didn�t bear fruit. Rob didn�t whine about the rules. When Porsche announced their $1.5 million asking price plus mandatory spares package for the RS Spyder, he opted for the deuce. Why all the history? Regular readers of this site know what I�m talking about. 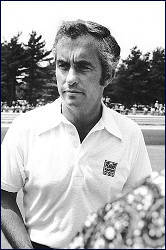 The American Le Mans Series has become the home of American individualists, Roger Penske and Rob Dyson being at the head of the class, but also those like the Fields, Andretti, Bobby Rahal, Mike Peterson, Giuseppe Risi, Duncan Dayton, Bryan Willman, or the man himself, Don Panoz. Corporate types like Chip Ganassi and his partner Carlos Slim or mercenaries like Kevin Buckler can play elsewhere. As I was sitting by the fire reading the story of Gar Wood the news was coming over the ether of Big John Hindhaugh�s interview with Audi Director of Motorsport, Dr. Wolfgang Ullrich. The good doktor has made a not-so-subtle threat to pull Audi�s diesel Koenigstiger out of the ALMS after Sebring if Tim Mayer and Doug Robinson don�t rescind the restrictor break IMSA has granted to the P2�s, allowing them to run under last year�s rules. I have to say that Ullrich had a familiar look of a smart-assed witness on the ropes about him at the season ending post-race PC at Laguna this past October. I wasn�t surprised by Henri Pescarolo�s letter complaining that Ullrich and the Peugeot people had been heavily lobbying the ACO technical committee to screw the petrol-heads in favor of oil-burners. Audi�s seven year hammerlock on sportscar racing is finally being faced with some serious competition and the good folks at VAG can�t handle it. Let the P2�s run with less intake air in France this summer, but Dr. Ullrich just proves himself to be the antithesis of a sportsman when he threatens to pull out of the ALMS over a rules package against which his R10 was undefeated in 2006. My dear wife was a regular business traveler to Germany throughout the eighties and early nineties, and many of our German friends warned us of a cultural change after the Wall came down in �89. I always considered the laid-back Germans to be the most honest and hard-working people on the planet. Now I fear that there are no Germans left like �uncle� Norbert Singer and his band of Smurfs in brown overalls. Welcome to the new land of Schumi and winner-take- all corporate types. I find myself wondering whether Lucas Luhr�s late race spin while teasing the R10 at Laguna this past October was calculated to please his soon-to-be employers � a sportscar version of Michael Schumacher�s shameful 2006 Monaco qualifying game. It saddens me to think this way. Porsche, BMW, and even Daimler-Benz have an enormous profit center in North America, but VAG and their Audi brand haven�t been able to figure us out since the �Think Small� days. Audi�s profile as a purveyor of luxury goods remains pathetic, and the brilliant R10 could go a long way toward changing the way Americans see them. I�ve said before that the ALMS will not thrive as a vorsprung durch Technik demonstration run. It�s silly not to race, and the 2006 P2 rules don�t suggest a walkover by the P2 teams. While Audi has offered financial support to the series, it�s not been of the make-or-break variety. They need the ALMS to market their Le Mans-winning technology to Americans. I am not tying to suggest that Americans of the 21st century have come to stand on some sort of higher moral ground than Germans (far from it), but it�s clear that Audi (and BMW and Daimler Benz) have lost touch with the history and traditions of American racing and even though their executives speak in unaccented and idiomatic English they have lost touch with our market. GM�s efforts with Corvette Racing, Ford�s with ChampCar, and the pre-�merger of equals� Viper program are proof that NASCAR occupies the national stage only by default. It�s high time companies like VAG realize that there are benefits from playing in the American market. The Automobile Club de l�Ouest has tolerated competitive variations in the American version of their formula and their fields have benefited from strong American entries throughout the new century. Dr. Ullrich�s corporate winner-take-all thinking does not honor great gentlemen like Briggs Cunningham, Roger Penske, and Rob Dyson. One can only imagine what Gar Wood would have done. When the Gold Cup rules committee fell into corporate-think, he simply bought a carload of surplus Liberty aircraft engines and beat the world. Tim Mayer and Doug Robinson have done the right thing for American racing.